You've probably heard Up Dog, Cobra and Sphinx pose called out in many a yoga class. But do you know the essential differences between the three poses? Here's a quick introduction or review of what makes each of these poses unique, whether you've taken 1 class or hundreds! I see it frequently in the course of my public classes, especially with beginners but also with more experienced practitioners. The difference between these three popular backbends can be a bit confusing. So let’s go through them one by one so you can have a visual example of their differences and be more comfortable knowing which to choose in your next class. This might be your “lowest” backbend in that you can keep it pretty close to the floor. You might be lifting just your head up. Or you may go higher as shown in the picture above. Your pelvis can stay on the floor here but as you start to come up higher the top of your pelvis may lift until just your pubic bone is still touching the floor. How much the pelvis comes up depends greatly on your specific anatomy and flexibility. A primary difference between cobra and up dog: Cobra maintains slightly bent elbows, even at it’s fullest height. Thighs and parts of the pelvis remain on the ground. A primary difference between cobra and sphinx: Only the hands are on the ground in Cobra, not the forearms. I’m skipping to Up Dog for a moment as it has the most in common with Cobra, but has some key differences. Here the arms are straightening while maintaining a micro bend in the elbows and relaxed shoulders. The tops of the feet are pressing strongly, just like in Cobra, but here they are the only part of the legs touching the floor. The thighs are lifted as well as the shins. So basically the only points of contact with the earth are through the hands and the tops of the feet. A primary difference between Cobra and Up Dog: Only the feet and the hands are touching the ground for most bodies. A primary difference between Up Dog and Sphinx: There is much LESS connection to the earth in Up Dog than Sphinx. Sphinx pose in many ways is the odd pose out in these three poses. While the legs in this pose are similar to Cobra in that there is full connection and the engagement comes from the press of the tops of the feet, the upper body is quite different. Here you’ll find the palms of the hands all the way through to the elbows are on the earth. The elbows are ideally aligned underneath the shoulders from front to back AND from side to side. I often offer that if you find that alignment too deep for your back because you are still developing you ability to support the pose, you can walk the elbows farther forward of the shoulders to reduce the depth of the backbend. As the shoulders relax away from the ears and the spine lifts off the earth the forearms help with the “lift” of the pose by pressing down. There can also be a slight draw back on the forearms towards the hips (without actually moving them) that helps engage the shoulder blades and opens the front of the chest. When might you choose one of these poses over another? In a vinyasa yoga class, you’ll typically find Cobra or Up Dog offered in the actual vinyasa sequence (that combination of poses that shows up regularly of Down Dog, Plank, Cobra or Up Dog and back to Down Dog). Often you might do several repetitions of this sequence with Cobra first to help prepare for the greater spinal demand of Up Dog (you might also use Locust as part of this preparation for deeper backbending as I often do in my classes, but that’s beyond the scope of this article). Once the body is warm and ready, you might then choose to move into Up Dog in this sequence. Typically, you won’t find Sphinx offered during the vinyasa sequence, as it can be a bit clunky to move into from Plank or even Chaturanga (but all rules are meant to be broken!) and may disrupt the flow of the sequence and the breath. It may show up at other times during the practice. However, if you are experiencing challenges in the wrists, hands or even the elbows, Sphinx can be a great substitution to still get in a juicy backbend while giving these joints a little more ease. Some people may also find it a little easier on the back as well. Remember that this is just a basic guide. There are many nuances that you may develop over the course of your practice, but I hope this guide helps you figure out the differences between these three often called for poses. Is there something that still isn’t clear for you? Leave me a comment and I’ll try to clarify! There's a lot of conflicting information out there about meditation. The common misconception is that when you are really and truly meditating, your mind will be blank and you'll be free from all those crazy thoughts we all have day in and day out. While that's a lovely goal that some beings may be able to achieve, for most of us meditation is really more about the exercise of doing it. I like to think of it as a muscle you have to exercise, just like any other, in a way that's appropriate for that muscle. The text below comes from an interview I did with the Monadnock Ledger-Transcript in 2016. You’ll find the original article here. Q. We hear all the time that meditation is good for us. How exactly does it benefit one’s health? A. The benefits of meditation are so vast that whole books have been filled on the subject! Meditation practice can have direct physiological and psychological effects such as the lowering of blood pressure, reduction in perceived stress level, relief of anxiety and depression, relief of temporary and chronic pain, improvement in the ability to concentrate and pay attention, and a general sense of greater well-being. Meditation is also shown by current scientific studies to be a key factor in the phenomenon known as neuroplasticity, where the brain, even at later stages of life, can actually rewire itself and create new pathways when needed. Meditation helps create pathways that can be beneficial to health, such as helping you stay the course with those New Year’s resolutions! Q. It seems there are as many techniques for meditating as there are yoga styles. How does one sort through the maze of options and get started? A. That’s so true! It really can be overwhelming! 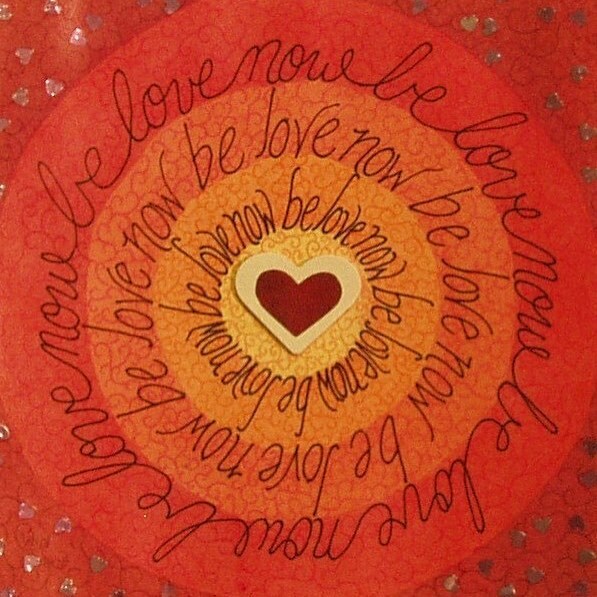 But I’m reminded of a portion of the book “Be Here Now” by Ram Dass. He quotes the great Lao Tsu, who said, “The journey of a thousand miles begins with one step.” He then asks, “But where do we begin? The answer is simple: You begin just where you are.” Do you see mention of a technique somewhere that appeals to you? Give it a try! But don’t just try it once and decide it isn’t for you. Meditation, like so many things, is something that you have to build a relationship with. Choose a method, and commit to trying it for a week. If you’re new to meditation in general, start small. Even 2-5 minutes has been shown by many studies to start to bring about beneficial changes. Practice two to five minutes of your chosen technique for seven days, every single day and at the end of that time see how you feel. If it just isn’t working for you, try something else. If you aren’t sure, try another seven days. It’s more important to dive in and take that first step in giving it a try, than to agonize over the choice. You can always try again and you can always try something else. Once you find something that works for you, stick with it; 40 days is a traditional time period for committing to a practice. After that time you may want to try a different technique. Or maybe you’ll continue with the same technique. It’s all up to you! Q. It seems like the thoughts in the head are never-ending. How does one know they’re meditating? A. This is such a great question because I think there’s so much confusion and mystery around meditation. That question of “how do I know if I’m there” is so prevalent. People think that meditation is this mystical place you only can get to if you have some kind of special gift and you can make your thoughts stop. I used to struggle with this so much early on in my yoga teaching career. I always thought, “I’m a yoga teacher for crying out loud! Why can’t I do this? !” And then I’d get frustrated and give up. Then I had the good fortune to meet a wonderful teacher named Sharon Salzburg and her workshop totally turned my relationship with meditation around. Here’s the thing — you can’t stop your thoughts. Your mind is meant to think! That’s what it was designed to do! What you can do, is bring the mind to a single point of focus. That’s what most meditation techniques are asking us to do. We use a technique — such as following the breath or my personal favorite, repeating a mantra — as a tool to help bring the mind to that single point of focus. The moment of meditation is that moment when you notice that you are not with that single point of focus any more. That moment that you notice that you’re actually thinking about how much laundry you have to do later or what’s on your to-do list for that afternoon or that argument that you had with your spouse yesterday — that moment is the moment of meditation. Because that moment is the moment when you have this amazing choice to make. You can either give up and tell yourself you’re terrible at this meditation thing and just go back to your day, or you can let go of whatever it was you were thinking about, and draw your mind back to your point of focus, i.e. your meditation technique. That’s it. That’s the whole game. When you keep noticing you’re gone and you keep drawing yourself back to your point of focus, that’s when you know you’re meditating. Q. What exactly happens when one is meditating? A. What happens is that the process I described above goes on over and over again. Through that process, we start to train the mind to be here in this moment, rather than somewhere else. We develop the compassion to treat ourselves with love each time we release a thought to come back to our chosen technique. That’s a big one! Have you ever noticed how you speak to yourself? For most of us, it isn’t with love. We teach ourselves that we can always begin again. We corral that busy, busy mind that is always pulling us elsewhere, rather than being fully present in the moment. Maybe that doesn’t sound that profound, but when was the last time you actually paid attention to what you were eating, rather than talking on the phone, watching the TV, and checking your email? When’s the last time you actually sat with a loved one and fully heard what they had to say, rather than listening to, responding, or looking at Facebook? There are so many small but beautiful moments that we miss in life because we are being pulled in so many directions at once most days. Our lives are so hectic and so filled with anxiety. Meditation gives us a tool that helps us deal more skillfully with the challenges of daily life. It’s a muscle we have to build and grow like any other muscle. It takes practice, but it’s so worth it. Q. How did you get started meditating, and what motivates you to continue your practice? A. I was never a meditator in the traditional sense until I started yoga teacher training where a traditional practice was a required part of my training. I think yoga was my meditation before that — and is certainly a valid form of meditation in and of itself. The process of linking breath and movement and becoming fully immersed in the sensations of the body was an entry point for me. Training to be a yoga teacher gave me more of a traditional practice. What motivates me to continue? So many things! I have so much to learn. Compared to some of the great spiritual teachers like the Dalai Llama, I’m just getting started! Who knows what else I may discover along the way. I’ve struggled with anxiety and depression since I was fairly young. As we move into the deep darkness of winter, that struggle becomes more difficult for me. My mediation practice has smoothed that bumpy road. It has made me less reactive, which makes me a better wife, daughter and friend. It’s also a professional commitment. I’m a better teacher if I can speak about the practice from a place of authentic experience. I hope to be a guide on the path for others who are struggling to begin like I did. It’s a key element in my spiritual practice as well. Q. Anything else you would add to this discussion? A. I was once told by a teacher of mine that there was a study done that took brainwave scans of people while they were meditating. The scans showed the difference in brain waves when one was meditating versus when one was just going about daily life. One of the study participants told the scientists after one meditation session, “Don’t even bother looking at my scans for today. My mind was all over the place!” They decided to look at them anyway and were amazed to discover that even though the subject didn’t feel like they were meditating, the brain wave scan showed activity that indicated that the person was, in fact, meditating! I found that incredibly liberating! So, if you’ve tried meditation before and you gave up because you thought you weren’t “getting it,” try it again now that you’ve read what I’ve written here. Spend some time with it. Build a relationship with it. Give it a solid commitment of time. I think you’ll be glad you did. Outdoor Yoga at Garwin Falls! 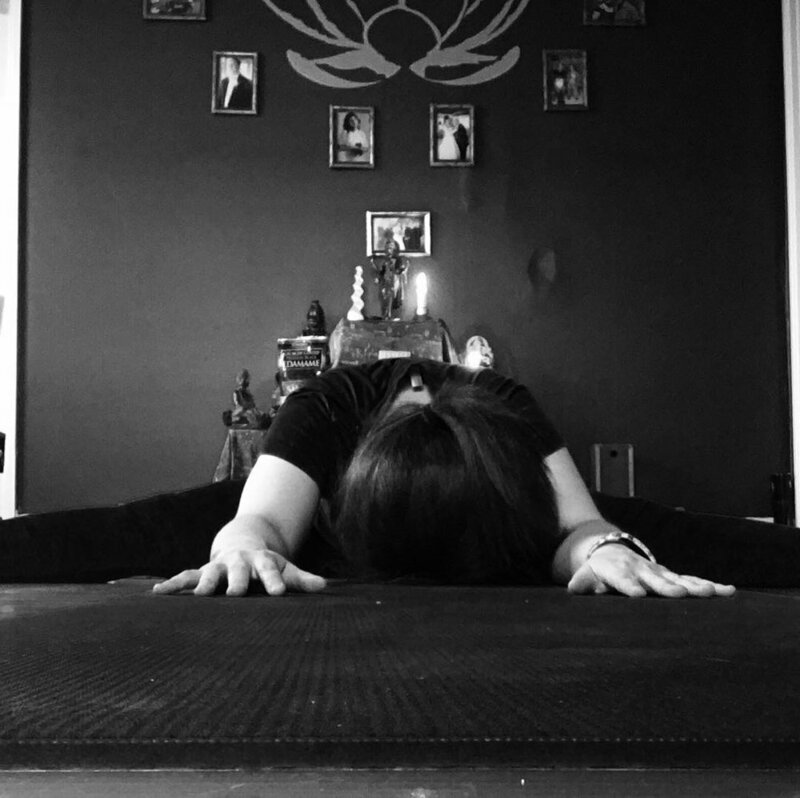 Yin Yoga for Hot Weather! Cats on Mats Round Up! We had an amazing time with our Cats on Mats event on May 6th! The kitties loved being able to run and play after being in cages for so long and we loved being a part of their antics. 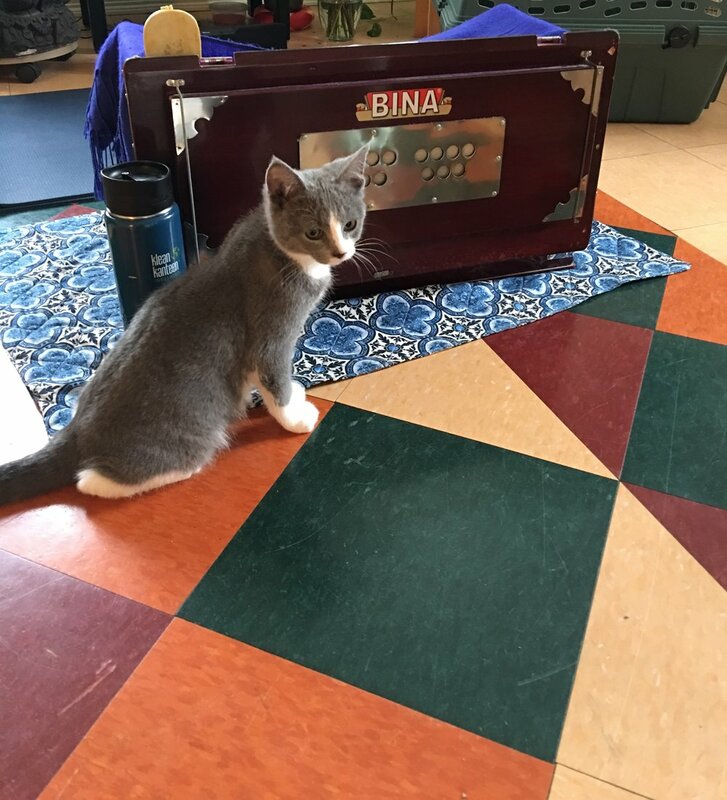 Our practice not only uplifted their lives but future residents of Monadnock Kitty Rescue and Adoption. We raised an awesome $575 to help build them a new home! I'm so happy that all the kitties that got to play with us that day were going to new loving homes the very next day. :-) As I said during the class, we wish we didn't have to do a class like this. We wish that there were no homeless animals. But until that day we will do what we can to help. Here are a few pictures of the event that we just loved! Thank you to everyone who participated and donated. We will definitely be doing this again in the future! Sorry for being a bit behind on getting this posted this time around! But here is the recording of our mantra for the month of March 2016. This mantra is said to invoke the quality of compassion as it is the mantra for the Tibetan Buddhist goddess known as Tara. She is a beautiful goddess who shows up in a variety of colors (perhaps you've heard of Green Tara?) which represent different aspects of her compassionate nature. This mantra is said to be a protective mantra. It invokes the energy of the protective mother. It is said to bring about self confidence, especially in women. Chamundi is another name for Durga.